Users will still receive a $5 discount on their monthly plan payment for using auto refill. So $45 plan users will pay $40 before taxes and $60 plan users will pay $55 plus taxes. The discount will be in the form of an account credit instead of a credit to the debit or credit card used for auto refill as it is now. New users enrolling in auto refill should set up their auto refill amount to be $5 less than their monthly plan price. $45 plan users should set up a $40 auto pay, $60 plan users should set up a $55 auto pay. The first Auto Refill charge will be for the full $60 or $45 plan account. Every month, after the automatic payment is made, AT&T will add a $5 credit to the user's account. Subsequent auto payments will be for $5 less than the plan price. It looks like current Auto Refill customers just need to reduce their Auto Refill payment amount by $5. Customers can enroll in Auto Refill at www.att.com/mygophone or by calling 611 from their GoPhone or 800-901-9878 from any phone. For Auto Refill and the discount to work properly, customers should set it up with an Auto Pay amount of $5 less than their plan price and set the Auto Refill date to one day before their plan's expiration date. Auto Refill can be funded with a credit or debit card or an e-check. Only customers on monthly plans of $45 or higher are eligible for the $5 Auto Refill discount. 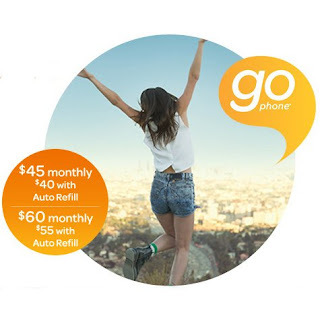 Although the Auto Refill discount is better than nothing, it's not necessarily the least expensive way to fund a GoPhone account. Because AT&T operates in all 50 states, it's required to charge all applicable state and local point of sale taxes and fees. That includes state and local sales taxes plus point of sale E911 fees which can be as high as 9% (GoPhone E911 tax list) in some locations. It's generallty less expensive to use an online service like Callingmart.com, which doesn't charge taxes. Callingmart offers a 10% discount to GoPhone customers who enroll in Callingmart's own auto pay program or use the 10% discount coupons that Callingmart offers every month. Note that depending on state and local laws, customers may still be legally required to pay some or all of the taxes they avoided by buying online. Dennis, your article says "Auto Refill can be funded with a credit or debit card or an e-check". The significant word in that sentence is "e-check". E-checks will be allowed for the first time, starting August 16. Previously only credit cards and debit cards were allowed. Apparently AT&T has adjusted the auto-refill amount automatically for existing customers--at least it appears that way when I look at my account.